The season of mangoes is coming to end now in India. I was in my native this year throughout the mango season. There are lot of mango trees in our backyard, but this year, we couldn't get any mangoes there! Of course we bought mangoes from the city, but its not at all equal to the home grown ones. When it is the mango season, most common dessert we prepare at home is Mango Seekarane (Rasaayana). Either it can be served as dessert or as side dish with Dosa or Roti. 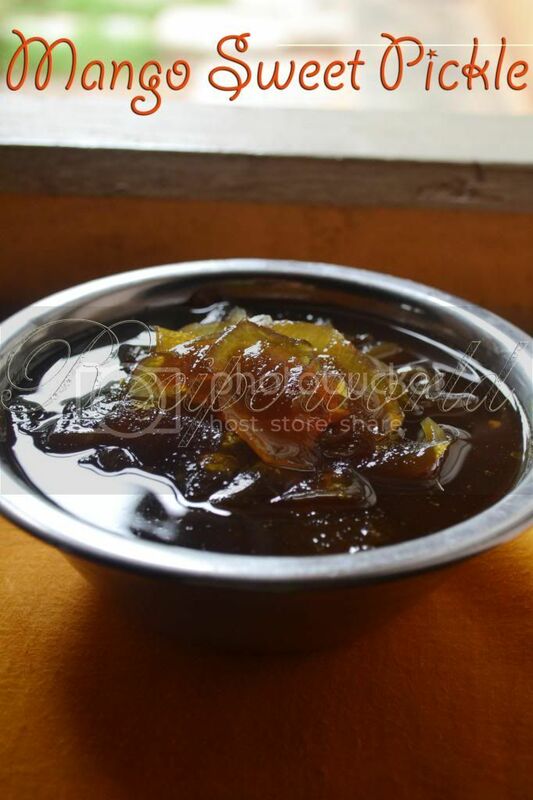 Click here to know more about Mango Seekarane. Coming to the recipe part, its a sweet and tangy dish which I had recently at my sister's place. It was prepared from raw mango and they call it as 'Mango Sweet Pickle'. Just learned the preparation method from them and tried it at home. Everybody at our home liked this pickle. Hope you will also like it! Peel off the mango and cut it into thin slices of medium size. Heat water in a vessel. Add the mango slices to the hot water and cook it for a minute or till half done. To this, add salt, jaggery, slit green chillies and cook till the syrup becomes thick (May be 2 1/2 string consistency). By the time the syrup becomes thick, mango slices will be cooked fully and they will become transparent. Transfer the prepared sweet pickle to an air tight jar and use it when required. This can be stored up to 2 - 3 weeks. This pickle goes well with rice like any other pickle. Any unripened mango can be used for this recipe. But Totapuri Mango is the most suited one. Red chilli powder can be used instead of green chillies for this recipe. This pickle should be both sweet and tangy in taste. When the pickle is almost done, check and adjust the taste. If the mango does not have a sour taste, few drops of lime squeeze can be added to make the pickle more tasty. 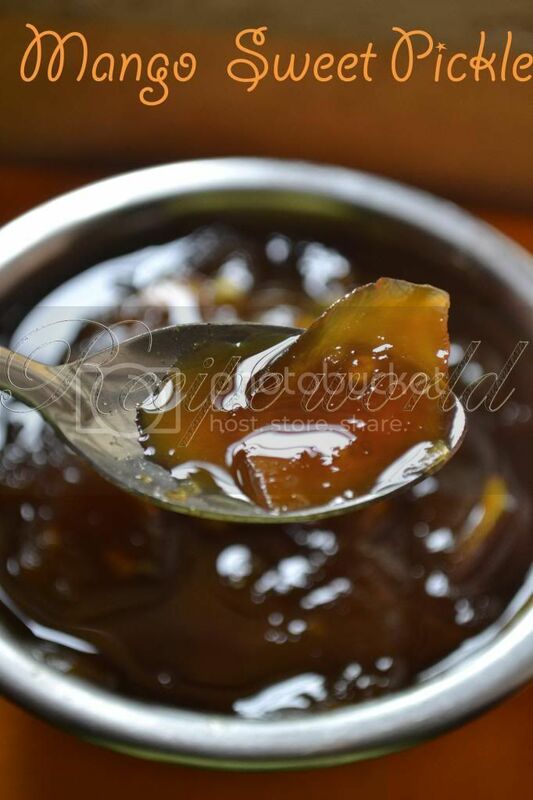 Sweet mango pickle looks tempting..
Woow, one of my fav. sweet pickle.. Thanks Anupama..nice to know another name for it! Omg, mouthwatering here....i can finish that bowl in no time, droollllll..